Image by pirate johnny via FlickrI collect recipes, from everywhere. I cut them out of the Sunday paper, out of magazines, out of the coupon section of the paper. 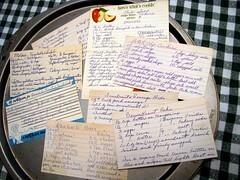 I have some of them organized in one of those 'magnetic' photo albums, and I use a lot of those recipes over and over. I have a whole bunch more in a shoe box and some organized in envelopes - according to recipe type - and more in a large envelope, and... Well, I have recipes all over the place and, even though I cut them out originally because I really wanted to try them, I usually never do get to try them - because I can't find them again! Or, even worse, I try a recipe that we really like but then I can't find it again! And that's just the printed recipes. There are so many recipe sources online. Sites where you can find recipes for just about anything and even save those recipes for later use. The problem is that there are so many sites - and I've signed up for and saved recipes at most of them. But finding those recipes later? Not so easy, because who can remember where a particular recipe came from? That's why I'm loving RecipeNut. It's a site for gathering, collecting, and sharing recipes from anywhere. Adding a recipe from another site is as simple as pasting in the URL. RecipeNut finds the recipe info, you add some tags, select some categories to make the recipe easier to find on the site, and save it. I've been saving all the online recipes I want to try at RecipeNut for a while. So now I always know where to look! Now I just need to get around to all the recipe sites and save the recipes I liked over there to RecipeNut so I can find those too. And all those printed recipes? I'm either going to have to start finding them (or something similar) online so I can save them to RecipeNut, or I'm going to have to add them myself. You can add your own recipes, too by manually entering measurements, ingredients, and instructions. Personal recipes can either be shared with everyone else who visits RecipeNut, or you can keep them private. So, if you want to save your grandma's secret chocolate cake recipe, you can keep that to yourself. Besides being a great place to save recipes, RecipeNut is a great place to find them too. All the recipes there are recipes that people thought were worth saving and sharing. I usually end up saving one or two from the front page where they always show the most recently saved recipes. It's easy to save them, just click 'Save' and it's added to your recipe box. You can also browse through the categories such as Main Ingredient, Meal/Course, or Occasion to find recipes. I haven't done that a lot because I'm still saving all these other recipes - I'm afraid I'd never stop!